The "Bone Stock", manufactured by CNC Warrior, is designed particularly with AK variant guns in mind. Provides clearance for the trigger and mag release in the folded position. This buttstock is machined completely from 6061 T6 aluminum billet and black hardcoated for a durable matte black finish. It is currently available in a 9" (NATO) and 8" (Warsaw) length. *Only compatible with the SAM7K pistol w/ factory sling swivel. Not compatible with the SAM7k-44. This hinge is designed to lock up solid, and provide years of trouble free use. It's minimal weight makes it an excellent choice for those who want to pack it light. Includes a hardened stainless steel bushing around the hinge pin to prevent wear. Based on the CNC Warrior / Bonesteel Arms hinge system that has proven itself trustworthy throughout years of faithful service to customers all around the USA. 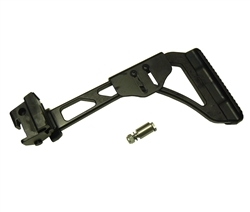 Contoured to match the rear of your gun, this stock provides a nice factory look and installs without the use of any adapters and without requiring modifications to your gun. All models have an extra deep QD sling swivel pocket on the hinge base.